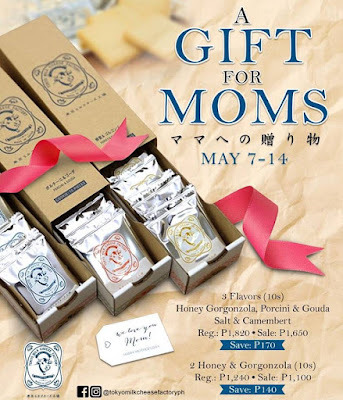 Check out Tokyo Milk Cheese Factory Mother's Day Promo, available in all their branches until May 14, 2018. Save P170 when you purchase one box each of Milk Cheese Cookies: Honey & Gorgonzola, Salt & Camembert, and Porcini & Gouda. Save P140 when you purchase two boxes of Honey & Gorgonzola Milk Cheese Cookies. Visit the nearest Tokyo Milk Cheese Factory branch and give your mom the gift of exquisite taste.